Rometty made the comments yesterday at the World Economic Forum in Davos, Switzerland. The CEO said that technology’s fast-moving pace here in the 21st century makes it harder for people to find jobs and has led to disillusionment with the future. 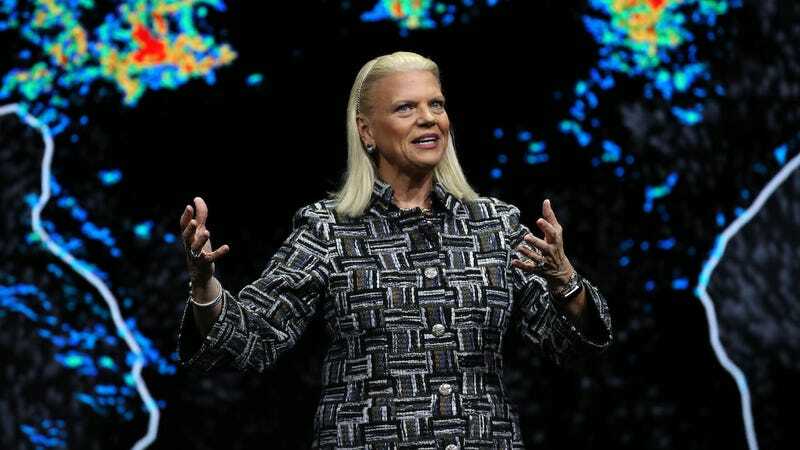 “I think those of us or benefit from the technologies, we have a really serious duty about this because these technologies are moving faster in time than their skills are going to change,” Rometty said about the masses of people who are trying to get and retain jobs in the tech sector. Rometty said that she believes this frustration led to Brexit, the United Kingdom’s referendum that will cause it to leave the European Union in March. Brexit is not going well right now, to say the least. Average people are even buying up emergency supplies and large corporations are pulling their offices out of Britain. As some commentators have said, it’s like the UK is preparing for a very real war that’s completely unnecessary. “All of us are full of companies with university degrees, PhDs, you’ve got to make room for everyone in society in these jobs,” Rometty said as other business leaders on the panel nodded their heads. What are the alternatives? As my colleague Brian Merchant reported yesterday, taxpayers might have to foot the bill for all of those people who are being put out of work by automation. But that’s not a new idea. People have predicting this exact thing since at least the 1930s when the big-T Technocrats proposed giving everybody a guaranteed wage from the government’s coffers after robots take all of our jobs. No one knows what the future holds, but we do know that there are going to be incredibly painful times ahead. Not just because automation is putting people out of work, but because the American economy more broadly is overdue for what’s called a “correction.” What’s a correction? That’s when the average person gets fucked, just like they did in the 2008 recession when millions of Americans lost their jobs, their wages were suppressed, and their homes were foreclosed upon. But don’t worry about people like Rometty. They’re going to be just fine. Especially since they’ve gotten so cozy with the Trump regime. Even Apple CEO Tim Cook has been rubbing shoulders with authoritarians. Yesterday, Cook and Microsoft CEO Satya Nadella had dinner with Brazil’s new fascist president Jair Bolsonaro. And using the word “fascist” isn’t hyperbolic. President Bolsonaro has said that he’s “proud” to be homophobic, that he’ll jail political dissidents, and has repeatedly romanticized Brazil’s former military dictatorship. But at least those companies will get to keep selling their products in Brazil, right? Can’t let the shareholders down.